The Electric Educator: Unlock the Power of Google Forms for your Classroom! 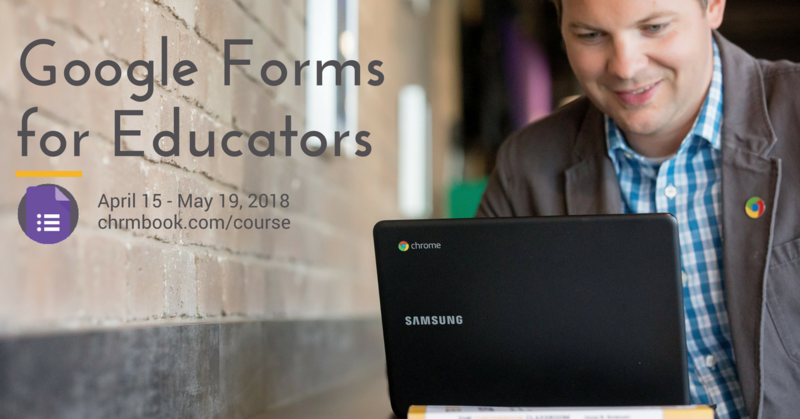 Unlock the Power of Google Forms for your Classroom! You have probably created a survey or quiz using Forms. That's great! I would love to help you unlock the full potential of Google Forms in your classroom. Google Forms can help you organize, streamline, and automate classroom tasks so that you can spend your time and energy connecting with your students. If you are sick of pushing paper around and spending time on procedural work like checking in homework assignments, scheduling parent teacher conferences, or collecting data for IEPs, Forms can help! Starting April 15, 2018 I will be leading a 5 week master course on Google Forms through Google Classroom. If you've tinkered with forms in the past, this course is for you! I will take you from tinker to expert in 5 weeks! During our first week we are going to explore the "building blocks" of forms - question types, data validation, add-ons, summary page, multimedia options, sharing and notification settings. During week 1 you will also identify areas of your classroom that could be improved through Forms so that we can build them later in the course. Google Forms is a great tool for assessment. In week 2 you will learn about using Forms for assessment and build a quiz for your classroom. We will go beyond multiple choice questions and look at multimedia questions, free response, reading prompts, matching, and more. Week 2 is devoted to helping your organize classroom record keeping. You will build a form to track lunch counts, attendance, on/off task behavior, hall passes, or whatever you want! We will also spend some time looking at the Forms summary of responses to organize and analyze data. Google Forms + Sheets is a powerful combination that can be used to create automated sequences. During week 4 you will learn how to use Forms + Autocrat to create certificates, book reports, research projects, meeting agendas, or other similar documents. Collecting information is easy; understanding what that information means and using it to take action is hard! During week we will analyze the data collected in our forms using charts, graphs, and filters. I will work with you throughout the course and will answer questions and provide personal feedback on a weekly basis. My goal for this course is to help you SAVE TIME by eliminating time-consuming processes. By streamlining and automating common, repetitive tasks you will have MORE time to connect with your students. The cost for this 5 week course is $99. Interested? You can register here!